Caption slip reads: "Photographer: Rustan. Date: 1955-07-11. Reporter: T.T. Assignment: Dr. Hutchins at Loyola workshop. 9/10: Dr. Robert M. Hutchins, President of the fund for the Republic. 22: L to R: Dr. Robert M. Hutchins, Fr. 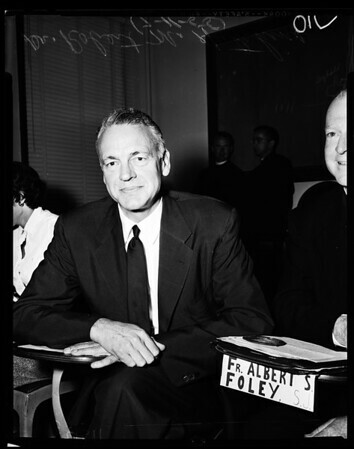 Albert Foley, S.J., workshop director, & Fr. Charles S. Casassa, S.J., President of Loyola University."